Funky 70’s. 1770’s that is… – Nerdwatch! 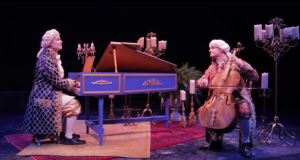 Classical music never sounded better than the Piano Guys’ take on it, melding 18th Century instruments and 1970’s funk, as they create a “quartet” playing “I Want You Bach”. Tagged 1770s, 1970s, Bach, classical, funk, music, Piano Guys. Bookmark the permalink.